What is a Transverse Lobe Piercing? A transverse, or horizontal, lobe piercing is done in about the same spot as a traditional lobe piercing, but rather than being pierced from front to back, it’s pierced from side to side. 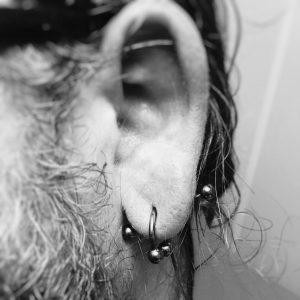 Like a traditional lobe piercing, it’s relatively quick and not super painful, and gives you a unique spin on the old classic. 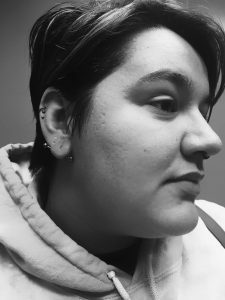 Transverse lobe piercings can vary in location depending on the shape of your lobes, and whether they’re attached or unattached, so there can be a great variety in style with this type of piercing. What Is the Healing Time for a Transverse Lobe Piercing? Because the hole for the transverse lobe piercing is longer than a traditional lobe piercing, healing times are longer. It can take anywhere from 6 months to 1 year or longer to fully heal. With consistent aftercare, you can usually change the jewelry in about three months. As with any ear piercing, you should restrict cellphone or over the ear headphone use to the ear that has not been recently pierced to avoid moving the jewelry, placing unnecessary pressure on the area, or introducing bacteria or dirt to the area. 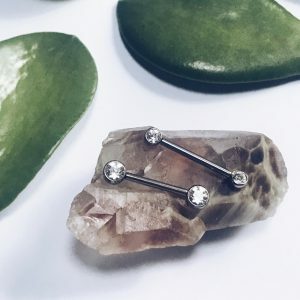 As with any new piercing, don’t move or twist the jewelry unless you are doing your aftercare as doing so can damage the new and fragile tissue at the piercing site and lengthen the healing time. You should avoid touching your piercing at all except to clean it, and you should wash your hands thoroughly with soap and water before doing so. During your piercing service at Almost Famous Body Piercing, your piercer will give thorough aftercare instructions, and give you an informational pamphlet in case you forget anything. We have the recommended products ready for purchase at the conclusion of your visit, and always add the aftercare cost into the total price of the piercing so you know what your total will be when we ring you up. Transverse lobe piercings are a new spin on an old classic and are becoming quite popular for people who want to spice up this popular piercing site. The most popular form of jewelry for the transverse lobe piercing is the barbell. When jewelry is inserted, it shows both ends of the barbell, giving a minimalist and subtle look. We now have titanium barbells with side facing gems that are perfect for a transverse lobe piercing. This jewelry has no threading, and the bezel set gems really sparkle. You can also add spikes, opals, or colored titanium beads to the ends as well. Contact Almost Famous Piercing today to get more information about the transverse lobe piercing and to get answers to any specific questions about piercing procedure, healing time, and aftercare. Stop in at any time to chat with one of our licensed piercers and see how this latest trend can update your look!